The Future of Search: Stop Searching. Info Will Find You. Article Leads: Use in emails, summaries, etc. New thinking: Instead of needing to search, how well will you succeed when the information you need finds you? Short lead (160 characters): Search has become the fuel that powers much of our lives. Now imagine something better, a you-centered digital world where knowledge turns active and finds you. Long lead #1 (399 out of 400 characters): All over the world, search has become the fuel that powers much of our lives. From getting directions to learning how to do something, from shopping to travel reservations, searching is one of the main ways we get things done. It’s so prevalent we can’t imagine life without it. Instead, imagine something better. Imagine a fully digital world of tomorrow where knowledge turns active and finds you. Long lead #2 (397 out of 400 characters): Search has become the fuel that powers much of our lives. Now imagine something better, a you-centered digital world where knowledge turns active and finds you. You become the filter and your behavior the trigger. Relevant info, choices, places and services will be delivered as optional parts of what you do, so you can succeed instantly. Will you skip searching when the info you need finds you? (Optional) AFTER the lead, BEFORE the first image: Chapter 2.2 from the new book, Imagine A New Future: Creating Greatness for All, asks: Instead of searching, what happens when the information you need finds you? Search has become the fuel that powers much of our lives. Now imagine something better, a you-centered digital world where knowledge turns active and finds you. You become the filter and your behavior the trigger. Relevant info, choices, places and services will be delivered as optional parts of what you do, so you can succeed instantly. Will you skip searching when the info you need finds you? All over the world, search has become the fuel that powers much of our lives. From getting directions to learning how to do something, from shopping to travel reservations, searching is one of the main ways we get things done. It’s so prevalent we can’t imagine life without it. Instead, imagine something better. Imagine a fully digital world of tomorrow where knowledge turns active and finds you. Tomorrow’s world will be you-centered. Like GPS that knows where you’re located, your connected screens, devices and network will know the steps you take as you do them. GPS identifies which routes people take and then delivers that as turn-by-turn guidance to other travelers. In the future, networks will learn the steps people take to complete their tasks, and deliver that as step-by-step guidance to anyone who wants it. As soon as you type in Google search you experience the start of this. Auto-complete suggests what you’re likely to want. Pick one and you’re done. Auto-complete is also in web browsers, email, text messaging and other tools. Online learning from and to millions of people is in every keystroke in these tracked tasks. The advanced Expandiverse Tech and IP step is called Active Knowledge. In tomorrow’s you-centered digital Earth — our world in the future — you become a filter and magnet for the appropriate knowledge for what you do. Your screens and connected devices will give you the option of turning to the world’s best information alongside your steps and tasks. No longer a separate search, your best choices will turn into an embedded feature. This evolution should be as obvious as it is predictable. Look at how music, photography, news and other industries have been turned into features. Why not knowing how to succeed? Simply by going through a normal digital day, the information you might want will be part of what you do, an instantly available option within your screens and connected devices. Without search. Hmmm. Do tech’s leaders see this coming? Why did Apple start Siri, Google start Now, and Facebook start Graph Search? Devices — from silos to a family: In the future your devices will know you and respond to you like an automatic door. When you walk through an automatic door, it opens for you and then when you have gone through it, it closes behind you. When you start using one of tomorrow’s devices it will recognize you and display your digital environment. It will restore the state of all the pieces so what you do continues and moves to the new device with you. Then when you are done using the device it turns off. When you turn to your next device it continues your digital world for you. It’s like when you walk through a door and the physical world is always there. In the future it won’t feel like you change devices. All your screens will be one large device, providing a continuous you-centered experience as you turn to each next screen. Active Knowledge, search’s replacement, will be part of that. It moves with you so you’ll always have abundant information without needing to search. Architecture — from searching to an embedded feature: The future will see billions more devices connected than we imagine. So the Active Knowledge architecture has three configurations that are like a digital dog playing an endless game of fetch, tirelessly retrieving what you need for your current actions. The good news is you don’t have to throw the stick. 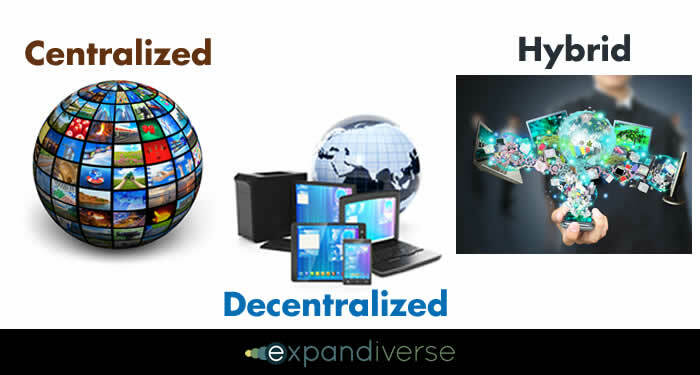 These three configurations are Centralized (processing is in the cloud), Decentralized (processing is in your local device), and Hybrid (processing is in intermediary devices or services that are either yours or on the network). The benefits flow to you in all the configurations: It sees your behaviors and offers information you may need without you even needing to know how. Because you know it’s there you can always move forward confidently and rapidly. You receive more than information. Active Knowledge can provide the “world’s best options” like services or resources (for you) for any task that’s important. When you want a higher level of performance, this is a system for changing “doing” into succeeding and becoming. Control — from physical to digital boundaries: New digital boundaries are the core of what allows you to create your own world and to ignore any elements of the media-driven world that displease you — even the latest overdone celebrity. It’s a little like adding a video recorder’s control to your on-screen world. You simply skip the “shows” you don’t want in your life, and let in only the “shows” you like. When you gain control, what will you let in and what will you shut out? Which of each day’s story lines are really important to you? Also, would you like to be paid for your attention by advertisers? That would be a reversal of fortunes. The power to filter messages is the power to be paid for your attention — especially by advertisers who now dive into your brain for free. Imagine how digital boundaries might alter your commercial earnings. If you gain control, will you feel more connected to your digital world than the real one? By choice. Let’s hope the real one doesn’t sulk too much. How long before history repeats itself? Online search hit paper-based publishers and libraries like a thunderstorm, drowning their customers with a flood of information and content that destroyed the publishing industry’s unique value. A you-centered digital world could hit today’s industries like a hurricane, blowing it over with embedded information and resources that turn customers in a new direction. 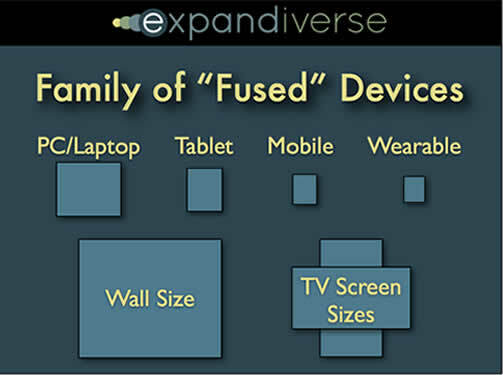 Expandiverse Tech adds a new combination: Continuous devices that follow you, auto-retrieval of what you need as part of what you do, and your control over your screens. Remember the lesson from Microsoft’s launch of Office’s uniform interface? In one strategic thrust they took the market away from their competitors in word processing, spreadsheets, presentations and email. Today’s leaders could do the same. 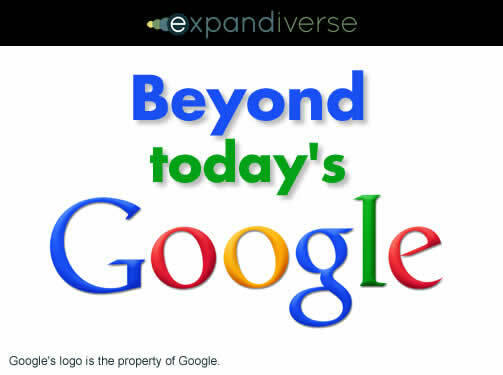 Google or Apple or another leading vendor might capture the future by acquiring and advancing tech to gain dominance. They could bring down their competitors’ leadership in many industries at once, in one multi-year step. The Future of Search could be a strategic lever. Stop searching. Just live your life and the information, services and resources you need are an instant, optional part of doing. If you’re the vendor, your ecosystem’s choices are delivered inside tasks — with your “store’s” 10% to 30% of this new digital world’s revenues. Active Knowledge could make a big difference to people everywhere. The impact on people and the world could expand tomorrow’s personal capabilities and power far beyond today’s search. Our digital future is inevitable. You could end the interruptions and skip the searches. What would you do with constant access to the info you need to go directly to success and become what you want right away? What will happen if billions of people worldwide do that? Are you ready for a successful world? Image credits: The second graphic is copyright Dan Abelow. All other graphics are credited to Shutterstock. <b>Devices — from silos to a family: </b> In the future your devices will know you and respond to you like an automatic door. When you walk through an automatic door, it opens for you and then when you have gone through it, it closes behind you. When you start using one of tomorrow’s devices it will recognize you and display your digital environment. It will restore the state of all the pieces so what you do continues and moves to the new device with you. Then when you are done using the device it turns off. When you turn to your next device it continues your digital world for you. It’s like when you walk through a door and the physical world is always there. In the future it won’t feel like you change devices. All your screens will be one large device, providing a continuous you-centered experience as you turn to each next screen. <b>Architecture — from searching to an embedded feature:</b> The future will see billions more devices connected than we imagine. So the Active Knowledge architecture has three configurations that are like a digital dog playing an endless game of fetch, tirelessly retrieving what you need for your current actions. The good news is you don’t have to throw the stick. These three configurations are Centralized (processing is in the cloud), Decentralized (processing is in your local device), and Hybrid (processing is in intermediary devices or services that are either yours or on the network). <b>Control — from physical to digital boundaries:</b> New digital boundaries are the core of what allows you to create your own world and to ignore any elements of the media-driven world that displease you — even the latest overdone celebrity. It’s a little like adding a video recorder’s control to your on-screen world. You simply skip the “shows” you don’t want in your life, and let in only the “shows” you like. When you gain control, what will you let in and what will you shut out? Which of each day’s story lines are really important to you? Get one email each week: See an alert when there is a free book giveaway, or see a new way to build tomorrow's Digital Earth. We respect your email privacy, and you can unsubscribe from any email. 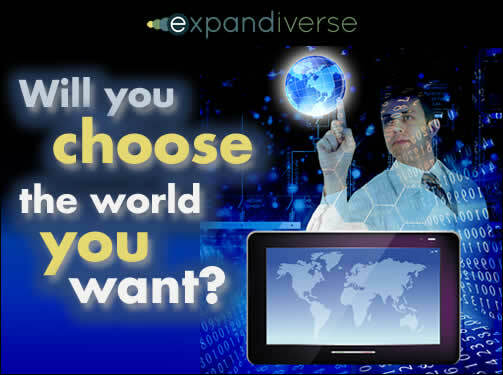 The Expandiverse.com website provides ideas and information for building tomorrow's Digital Earth today. Technology has taken us places we never dreamed possible. What’s next? Today’s Internet child will grow up into a mature Digital Earth. This evolution has begun, but what happens if we accelerate? We could build a Digital Earth that has the power to improve lives and fortunes everywhere across our planet. Dan Abelow is an American inventor, author, speaker and technology consultant. His latest patent-pending invention, the Expandiverse, is new technology to build tomorrow's digital world today. His previous patents are licensed by over 500 corporations that include Apple, Google, Microsoft, Samsung Electronics and many others. He holds degrees from Harvard and the Wharton School.